We now have an updated and revamped Donations page. It now contains our Corporate and Individual Donors categorized by donation levels of Platinum, Gold, Silver and Bronze. Also included are the Corporate Donors Logos. This will be updated on a regular basis as donations are received and approved by the Committee at their bi-weekly meetings. In conjunction with the donations list we have added the Donations as of ... bar to the right indicating the $ donated to date along with the %age the to date is of the target goal. Click here to jump directly to the new Donations page. This is the present cenotaph. It is being restored to its original state and repositioned to another area in the Park and facing to the east. This monument is dedicated to all Newfoundland airmen who lost their lives while serving with the Allied forces in World War II including the 125th Newfoundland Squadron of the RAF. This monument consists of 7 granite slabs and stands 20 feet at its center. The monument evokes the image of the tailfin of an Airbus A340-300 and encases two recovered pieces of steel from the World Trade Center in New York City. The monument stands 12 feet high overall and is constructed mainly of polished black granite with a stylized globe. Its represents the contribution made by the citizens of Gander as they hosted thousands of stranded passengers on September 11, 2001. "Sgt. 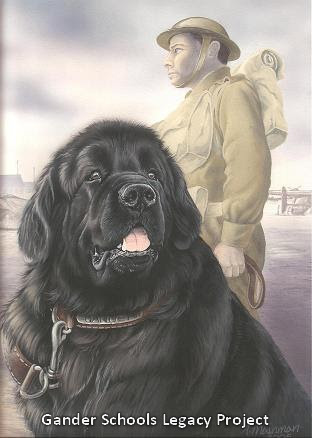 Gander, Regimental Mascot of the Royal Rifles of Canada"
This monument will consist of a life size statue of a sitting Sgt. Gander together with his standing soldier handler. It will be positioned so that it appears as if the dog and soldier are guarding the "Winged Victory". A long, low black granite wall (10m long x 1m height) will be set back from one side of the north / south runway and it will be inscribed with plaques commemorating the various air disasters which occurred at Gander. Gander cenotaph area renamed to "The Gander Heritage Memorial Park"
Sunday, September 16th was a momentous day for us as Mayor Elliott officially renamed the cenotaph area "The Gander Heritage Memorial Park" and unveiled two large billboards depicting the design of the future park. Also, in attendance for the unveiling was MHA Kevin O’Brien who announced his government’s support of the project with $150,000 in funding. Here is the Committee along with Levi, stand-in for Sgt. Gander. Levi was very popular at the ceremony and graciously posed for a number of photo shots. It is uncanny that Levi is almost an exact likeness in size and image of Sgt. Gander. Click here to read the related news article in the local Gander newspaper The Beacon.